I taught high school U.S. history for almost 30 years, and as we began our study, students knew the obvious answer: Abraham Lincoln. But by the time our study ended, several weeks later, their “Who ended slavery?” essays were more diverse, more complex — and more accurate. In coming months and years, teachers’ jobs will be made harder by Steven Spielberg’s film Lincoln, in which Daniel Day-Lewis gives a brilliant performance as, well, Lincoln-the-abolitionist. The only problem is that Lincoln was not an abolitionist. Spielberg and screenwriter Tony Kushner chose to concentrate on the final months of Lincoln’s life, when, as the film shows in compelling fashion, the president went all-out to pass the 13th Amendment, forever ending U.S. slavery. Missing from this portrait is the early Lincoln — the Lincoln that did everything possible to preserve slavery. Today’s Common Core State Standards propose that teachers concentrate on the compact and stirring Gettysburg Address, also featured in Lincoln. But my students and I begin with Lincoln’s first words as president, his first inaugural address, delivered on March 4, 1861. In this speech, not quoted in a single commercial textbook I’ve ever seen, Lincoln promised slaveowners that they could keep their slaves forever. He said that “ample evidence” existed in all his published speeches that he had no intention of ending slavery, and quoted himself to that effect: “I have no purpose, directly or indirectly, to interfere with the institution of slavery in the States where it exists. I believe I have no lawful right to do so, and I have no inclination to do so.” And, in less explicit, but no less clear language, Lincoln promised to “cheerfully,” as he put it, enforce the Fugitive Slave Act in protection of the nation’s “property, peace, and security.” Finally, in a gesture rich with irony, Lincoln said that he would not oppose the constitutional amendment that had recently passed Congress, “to the effect that the Federal Government shall never interfere with the domestic institutions of the States, including that of persons held to service.” Had it gone into effect, this slavery-forever amendment would have been the 13th Amendment to the U.S. Constitution. and in just the first three months after the Civil War began, returned more escaped slaves to their supposed owners than had been returned in the entire presidency of his immediate predecessor, James Buchanan. Lincoln’s stance on slavery as the war progressed was based on military rather than moral considerations. 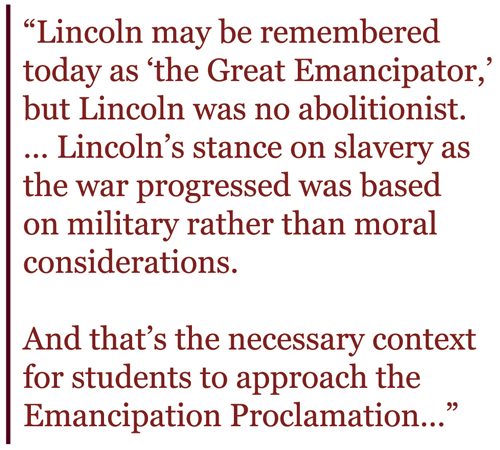 And that’s the necessary context for students to approach the Emancipation Proclamation, which took effect 150 years ago, on January 1, 1863. Interestingly, despite the fact that the proclamation is mentioned in virtually every textbook, it is never printed in its entirety. Perhaps that’s because despite its lofty-sounding title, this is no stirring document of liberty and equality; in fact, it does not even criticize slavery. “Emancipation” is presented purely as a measure of military necessity. Lincoln offered freedom to enslaved people in those areas only “in rebellion against the United States.” It reads like a document written by a lawyer — one who happened to be a Commander in Chief — not an abolitionist. It even goes county by county listing areas where slavery would remain in force, “precisely as if this proclamation were not issued.” According to Eric Foner, the proclamation left more than 20 percent of enslaved people still in slavery — 800,000 out of 3.9 million. No doubt, the Emancipation Proclamation was a huge deal, and it was cheered by abolitionists and even those who remained enslaved. As the great African American abolitionist Frederick Douglass pointed out, Lincoln’s proclamation united “the cause of the slaves and the cause of the country.” Those opposed to slavery were determined to use the Emancipation Proclamation as an instrument to end slavery everywhere and forever — regardless of Lincoln’s more limited intent. Freedom would be won, not given. With rare exceptions — like the American Social History Project’s fine Freedom’s Unfinished Revolution — middle and high school textbooks fail to credit the real anti-slavery heroes in this story: the enslaved themselves, along with their black and white abolitionist allies. While early in the conflict Lincoln was offering verbal cake and ice cream to slaveowners, the enslaved were doing everything they could to turn a war for national unity into a war to end slavery, impressing Union generals with their courage, skill, and knowledge — ultimately forcing Lincoln to reverse his early policy of returning those fleeing slavery and, in time, leading the president to embrace their entry into the war as soldiers. The actions of the formerly enslaved even turned some white Union soldiers into abolitionists. There was one case in the 5th regiment where a man named Cox claimed some slaves. He was very badly treated by the soldiers. He came there with an order from the division headquarters for two or three slaves. He pointed out who they were and undertook to take them away; but the soldiers pounced upon him and beat him severely. … He went away without his slaves. Who we “credit” for the end of slavery in the United States has important contemporary implications. 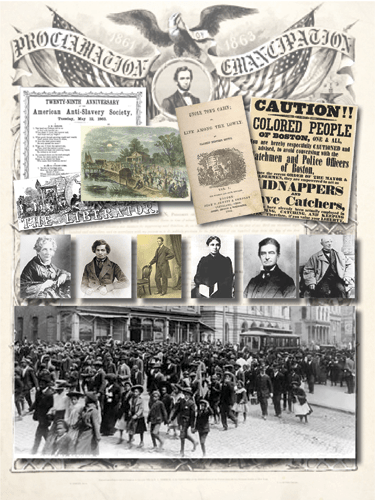 As Lonnie Bunch, director of the Smithsonian National Museum of African American History and Culture, points out in the film Monumental Myths, if it appears that Abraham Lincoln gave blacks their freedom, then “you create an environment where people begin to think, ‘Well, African Americans have always had things handed to them.’ It gets carried into the notions of welfare and the like” –African Americans as receivers of gifts from generous white people. So when I ask my students to write an essay on “Who (or what) ended slavery?” I get lots of different answers. But none of them credits a single individual. And all of them include evidence of how, in myriad ways, the people themselves make history.